Honolulu Community College advisor Lena Low, right, folded paper fortunetellers yesterday afternoon that explained the importance of both a clean and safe neighborhood during the Kalihi Weed and Seed Ohana Fun Day at Kapalama Elementary School. Low is part of the Phi Theta Kappa Honor Society at HCC. 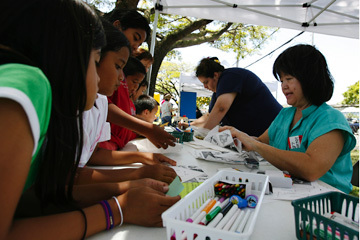 The event promotes neighborhood safety and environmental awareness and is endorsed by the Honolulu Police Department. 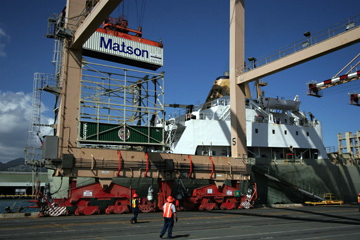 A 40-foot Matson shipping container holding donated used athletic shoes was lifted onto a ship to be taken to the mainland for recycling by Nike yesterday. Oahu schools and individuals dropped off approximately 6,000 pairs of shoes that will be shipped to Oregon and recycled into playground mats and various athletic surfaces by Nike. Although April 30 marked the first shoe drive in Hawaii for Nike's Reuse-a-Shoe program, the company has been offering the service to the public since 1999 and accepts unwanted athletic shoes at its Niketown store on Kalakaua Avenue.